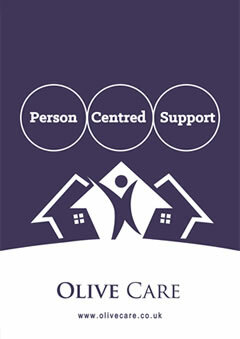 Olive Care is a Nottingham home care provider. We provide quality care and support in the comfort of your own home. Take a tour through our website to find out what services we offer and how Olive Care could benefit you. Olive Care was established in 2012 with a commitment to improving the quality of life of all the people that we support throughout the Nottingham area. Our aim is to provide a person centered service that treats everyone as an individual, helping them to remain living as independently as possible in the comfort of their own homes. Our Care Team is what makes us unique. We have a stringent recruitment process ensuring we only employ the right calibre of candidates to work with us and you. We provide our team with ongoing training and support, turning good carers into great carers. The majority of our staff have completed, or are in the process of completing their Diplomas, and the management Team are also encouraged to further their training. Investing in training and the development of our team continues to improve the quality of the service that we are able to offer, which in turn furthers the goals of the company, to provide you with the highest quality in home care. A great team is important to any company, however in the care sector a great care team is crucial. Having a passionate team that is equipped with all the necessary training ensures that you can be supported in the best way possible on every visit. We take great pride and responsibility in the sector that we work in. We appreciate that having someone in your home can be a bit daunting and for this reason we make sure we keep the same team of carers visiting you, to ensure you are completely comfortable with who is providing your support. We can provide support with personal daily tasks at home that may have become more difficult to do alone. Getting out of bed in the morning – We could support you in the morning, at a time of your choice, to help get your day started in the best way. Help with washing and dressing – We all want to look and feel our best, Olive Care could provide you with as much support as you need to help you get washed and ready for the day. Help and support with toileting – It may have become more difficult to deal with the more intimate tasks. We can provide support with a carer that you know and trust to make sure you remain comfortable throughout the day. Meal preparation – Eating healthy foods and snacks throughout the day is very important. You may need support for example to prepare breakfast, or make lunch or a snack. We can provide someone to support you to ensure that this is taken care of for you. We can provide support if the daily duties and housework are taking longer to complete or maybe they have become just a bit too difficult to do. Managing medicines – Making sure you have the correct pills at the correct times is very important. We can support you with someone to assist you with taking medication to let you have one less thing to worry about. Preparing and cooking meals – It is always nice to eat healthy meals and maintain a healthy balanced diet. It may have become harder for you to prepare meals and snacks. We can support you with someone to help you to do this. Washing up and wiping down surfaces – Maybe you are able to prepare meals throughout the day but are finding it more difficult to clean up after. We can provide you with support to take care of this for you. Shopping – It is always nice to have the fridge and cupboards stocked up with your favourite snacks and meals. We can support you with someone to collect any items you need, even if it is just some milk for a cup of tea. We can do this for you. Tidying, vacuuming and dusting – It may be useful for us to support you with someone to help keep your house always looking its best. Pet care – We know how important pets are. For example: if you have a dog that needs taking for walks, we can help arrange for someone to do this for you. Even if it just for someone to pop over and make sure your pets are fed, if this would help you, we can take care of this for you. We can also help with arranging and planning trips out, to visit family or friends. We can support with social activities like attending social clubs, bingo or the theatre. We provide support for even just going for a walk to get some fresh air and exercise. You may have an event to attend, such as a wedding or a funeral. We can provide assistance throughout the day; whatever you need we can arrange it for you. There may be times when a little companionship is needed, a friendly face for company if family or loved ones are away. We are able to cater for all types of visits, the choice is yours. Our home care team will always offer a personalised service, respecting those we support and taking into account their personal lifestyle, choices, culture and wishes. Whenever possible and if it is safe to do so, we let our clients do things for themselves. We aim to promote choice, control and freedom. We always preserve the dignity of our client, ensuring that we take a friendly and respectful approach whenever we are supporting them in particular with personal care. We try where possible to make sure that our clients only have a maximum of two or three support workers allocated to support them. This ensures individuals have the chance to really get to know their support workers. This also means of course that the support workers get to know the people they are supporting and the things that are important to them. We take great pride in the quality of our service. We want to ensure that you are being supported with the highest quality care in a way that you have chosen to receive it. This is the reason that we regularly check and monitor our service and seek feedback from the people we support and those close to them. We believe in creating an environment of continuous improvement, where support is closely monitored to ensure clients are satisfied with the services they receive. You don’t have to just take our word for it – take a look at the comments of the people that are using our service. At Olive Care, we are always looking to recruit passionate and dedicated care workers to join our care team. We currently have a fantastic team of care workers and recruiting good quality staff is crucial to maintaining the quality of care that we provide. Recruiting compassionate, friendly and reliable individuals and providing them with a supportive environment is the best way to continue to develop and strengthen our team. Our staff are supported with ongoing training to ensure their knowledge and expertise is current and up to date. All staff are encouraged to study for their Health and Social Care Diplomas and further their own professional development. We encourage internal development within Olive Care, an example being the current Care Co-ordinators began their journey with us as carers and have worked their way up to this role. If you are interested in joining us contact us now to arrange a convenient time to come and meet us. Olive Care offer competitive rates of pay and we have a strong commitment to staff training. All our new staff go through a comprehensive induction followed by further refresher training to enable them to provide the highest standards of support to our clients. Our Training page details the training that we cover. To apply for a job or speak to someone about working for Olive Care, please fill out the form below. Do you have access to your own car ? PDF or Word doc. Maximum size 10MB. Olive Care is dedicated to ensuring our staff are suitable and competent to carry out their duties and to ensuring they provide the highest quality care and personalised support. Our Support Workers also access a wide range of other training courses to equip them with the necessary skills, knowledge and sensitivity to be excellent at their job! We support our staff with ongoing training to ensure their knowledge and expertise is current and up to date. This enables the team to continue to provide the highest quality of care and support for our clients. We also offer QCF Diploma Level 2 and 3 in Health Social Care. We have opportunities for experienced community support workers/carers to support our clients that live in the Nottingham area. A passion for the care sector. Good knowledge and past experience with supporting elderly clients. An in-depth understanding of the importance and responsibility of this role. Over 12 months experience in the Home Care sector. Driving licence with access to a car. Ability to work flexible hours and alternate weekends. Competitive rates between £7.50 - £8.50 per hour. 28 days pro rata annual leave. DBS Check paid by company. Opportunities to study for Diploma. Career progression for the right candidates. If you feel that you are the right person for this role contact us now to arrange an interview. Copyright © 2016 Olive Home Care Ltd.